Unlike Earth, the sun does not have a solid surface. Rather, the sun is a ball of glowing gas through and through. About three fourths of the sun’s mass is hydrogen and one fourth is helium. There are also small amounts of other elements. The sun produces an enormous amount of energy in its core, or central region. This energy is not produced by burning fuel. Rather, the sun’s energy comes from nuclear fusion. In the process of nuclear fusion, hydrogen atoms join together to form helium. Like the sun, all stars are huge spheres of glowing gas. They are made up mostly of hydrogen, and they produce energy through the process of nuclear fusion. This makes stars shine brightly. The chemical composition of most stars is about 73 percent hydrogen, 25 percent helium, and 2 percent other elements by mass. This is similar to the composition of the sun. As they age, larger stars become even hotter than the sun. These stars have enough energy to produce heavier elements, such as magnesium and silicon. In more massive stars, fusion continues until the core is almost all iron. 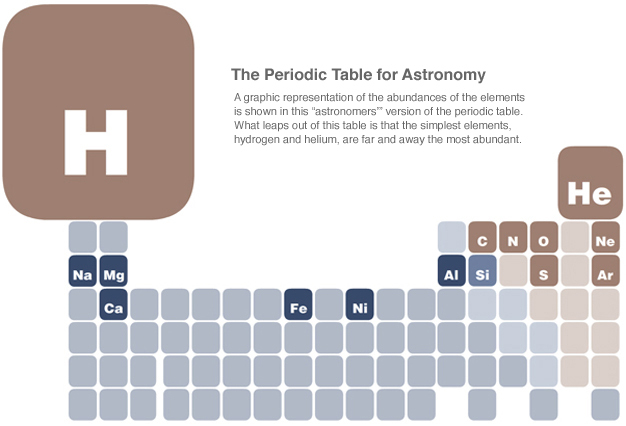 Find iron on the periodic table. You can see that there are many other elements heavier than iron. How are elements heavier than iron produced? In the final hours of the most massive stars, scientists have observed an event called a supernova. A supernova is a huge explosion that breaks apart a massive star, producing temperatures up to 1 billion degrees Celsius. A supernova provides enough energy for the nuclear fusion reactions that create the heaviest elements. The elements are blown off into space as the star burns out. Most astronomers agree that the matter in the sun and the planets around it, including Earth, originally came from a gigantic supernova that occurred billions of years ago. If so, this means that the matter all around you was created in a star, and all matter on Earth is a form of stardust.